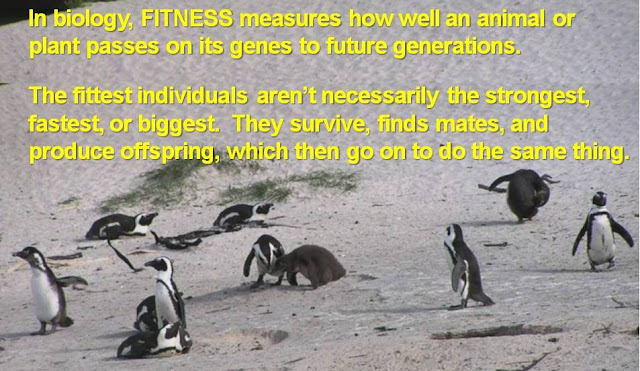 All-species fitness: Facial hair: hot or not? It's in Science magazine, so it MUST be science! Facial hair, and particularly stubble, has been a major fashion trend for men in recent years, and the importance of a beards in demonstrating masculinity and dominance, and even aggressiveness, among men goes back to ancient times. Facial expressions on bearded men have even been shown to be more effective than on the same men without beards. what's your favorite? Or do they all remind you of vampires? 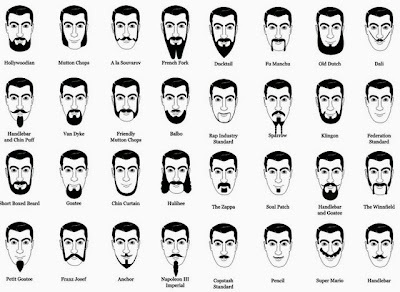 A recent scientific study published in the journal Evolution and Human Behavior analyzed the effects of a man's facial hair on others' attitudes towards him. 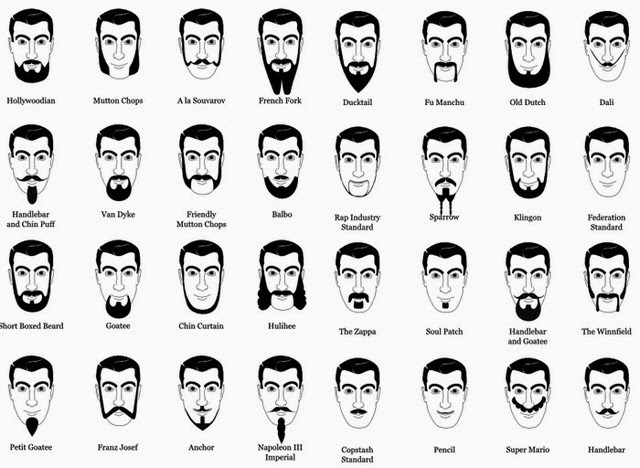 Previous studies of the attractiveness of facial hair have had mixed findings: in some, women found full beards were most attractive, while in others, they found cleanly-shaved faces most attractive. In the study, 10 men were photographed as clean-shaven, lightly-stubbled, heavily-stubbled and fully bearded and were rated by women and men for attractiveness, healthiness, masculinity and parenting abilities. So, 4 degrees of facial hair and 4 different ratings categories. In the somewhat mixed-up findings, women rated heavy stubble as more attractive than clean-shaven, full beards, and light stubble, while men rated full beards, heavy stubble and clean-shaven as more attractive than light stubble. In fact, light stubble received lowest ratings in nearly all categories. It's a few Graphs -- don't panic! while women nearly agreed, on the whole they thought guys with heavy stubble were most attractive. Both the women and the men rated the photos of men with full beards higher than other facial hair categories for parenting abilities, healthiness, and masculinity. 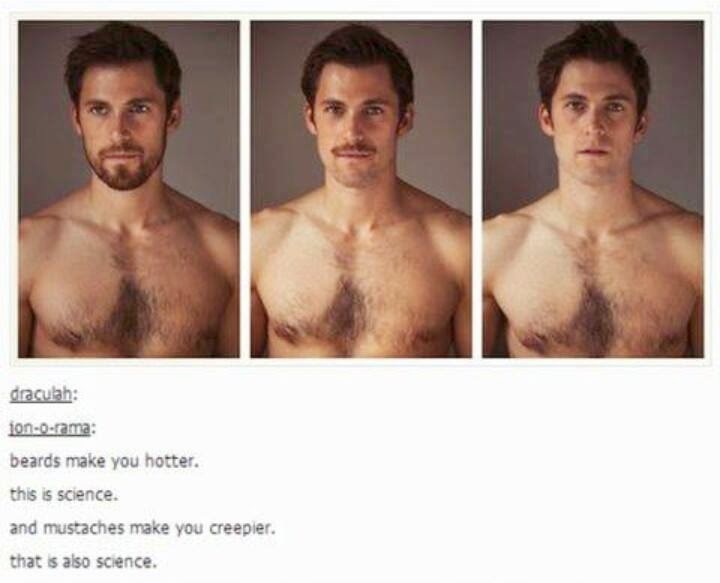 Why the love of facial hair in this study? 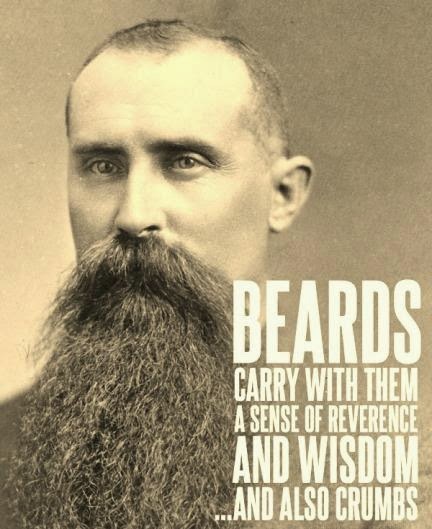 Facial hair is related to maturity and masculinity -- beards enhance the perceived age, social maturity, social status, industriousness, sincerity, and ambition of men -- and all of these traits are valued by women in long-term partners. More facial hair also suggests that the guy is more masculine, dominant, and aggressive, traits that could provide direct benefits such as protection to long-term mates but could also be destructive or dangerous. According to several previous studies, highly masculine men tend to have lower romantic attachment, less interest in long-term relationships, and report engaging in more short-term relationships. 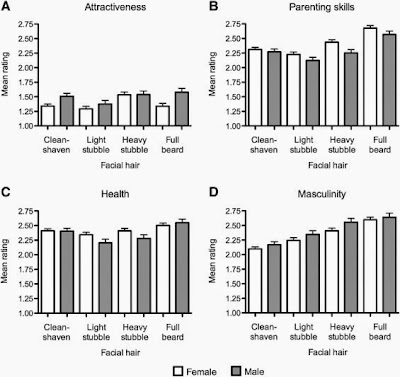 Highly masculine-looking men are often also perceived as likely to provide low paternal investment, yet in this study, women rated parental abilities of men with full beards highest. In some earlier studies, women preferred cleanly-shaven men over those with beards, particularly for longer-term relationships. The authors suggest that their use of smiling, rather than neutral, faces in the photos may have affected this result. We humans like smiles, so the combination of smiling faces with full beards might have encouraged women to give the bearded men in this study higher ratings for parenting skills, despite the also-high ratings for masculinity. So stubble clearly conveys that a man has reached sexual maturity, yet isn't so dominant and aggressive that he will abandon his woman. But why was heavy stubble so attractive to women, yet light stubble the loser in all categories? The authors couldn't really say, and I don't know either! Suggested answers are welcome! Previous studies have found men's attractiveness higher for men with clean faces, beards, and light stubble, so it appears to me that the current fashion and the location of a given study, as well as the display of faces, all affect perceived attractiveness. And then there is the difference between viewing a photo and having face-to-face contact with stubble. I will speak for many women (not Louise G, though! ), when I say Ouch. 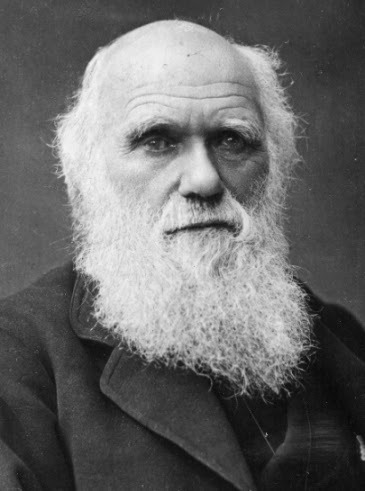 Darwin suggested that beards evolved because women preferred, and therefore mated more frequently with, bearded men. But, then again, he had a beard. holy crap my friends and I are on the floor dying. Thanks for the laugh Sue. This whole article had us floored really. Hi Michael, Glad the post got you thinking about it!